Is Skymark Airlines close to accepting ANA Holdings’ offer? Skymark Airlines (Tokyo-Haneda) is reportedly close to accepting financial sponsorship from ANA Holdings, the holding company of ANA (All Nippon Airways) (Tokyo) according to this report by our partner ZipanguFlyer. The bankrupt company received bids from over 20 companies. ANA would co-sponsor the embattled carrier with investment fund Integral Corporation according to this report. An official announcement is expected next week. 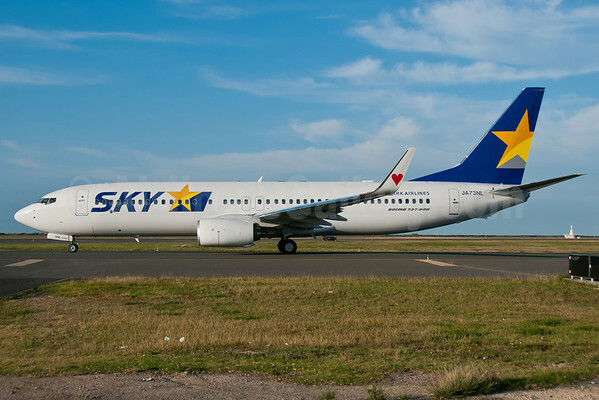 Will Skymark be able to retain its independent brand or become part of the ANA feeder network? Copyright Photo: Ivan K. Nishimura/AirlinersGallery.com. Under ANA, Skymark is very likely to remain a Boeing operator. Boeing 737-8HX JA73NL (msn 38104) passes through Honolulu on its long delivery route. This entry was posted in ANA Holdings, ANA-All Nippon Airways, Skymark Airlines and tagged 38104, 737, 737-800, 737-8HX, All Nippon Airways, ANA, Boeing, Boeing 737, Boeing 737-800, HNL, Honolulu, JA73NL, Skymark Airlines on April 19, 2015 by Bruce Drum.